The Reagan Years recreates the sounds of the 1980s; Talented musicians with very diverse vocal abilities enables this group to replicate uncanny versions of the Pop, Rock, New Wave and Heavy Metal hits of the M-TV Era. Bon Jovi , Madonna, Devo, Joan Jett, Def Leppard, Duran Duran, Billy Idol, Journey, Modern English, Guns ‘N Roses, A-Ha and ZZ-Top, and with the sax; Hall & Oates, Men At Work, INXS and Huey Lewis, the band covers all the mega-artists! You will sing along to every song! Since 1996, The Reagan Years has been delighting sold out crowds throughout the East Coast and entertaining 80's events as far away as Hawaii and country of Panama. In 2015, The Reagan Years took their Baltimore 80's party band to Europe and played Spain and Germany. This band pioneered the 80's tribute concept and like any great idea, many have imitated it however none have replicated the magic of The Reagan Years. Founded in 1996, The Reagan Years plays the greatest hits of the 1980s; a day when Ronald Reagan was President, M-TV first aired, CDs emerged, Acid Washed jeans were "Cool" and alternative music was called "New Wave". This period has resurfaced in today's entertainment industry. VH-1 has multiple segments echoing from the 80's Video Generation, radio stations across the U.S. feature artists from the 1980s in daily "flashback" programs while 1980s anthems have permeated TV commercials. The group has drawn the attention of the Media. In August 2012, the band was featured on FOX 5 Morning Show in Washington DC. Several articles have been written about the band including a feature story in Frederick Magazine April 2010 edition. TRY has been featured in The Baltimore Sun , Washington City Paper Pop Quiz Washington City Paper article about DC clubs, The Frederick Post, twice in the Gazette, Hagerstown Herald and PA Musician magazine as the March 1998 cover story. The band was interviewed on Baltimore's WJZ-TV Channel 13 in preparation of their 2002 New Year's Eve performance. The band appeared on Frederick Cable's entertainement show, Out On The Towne. 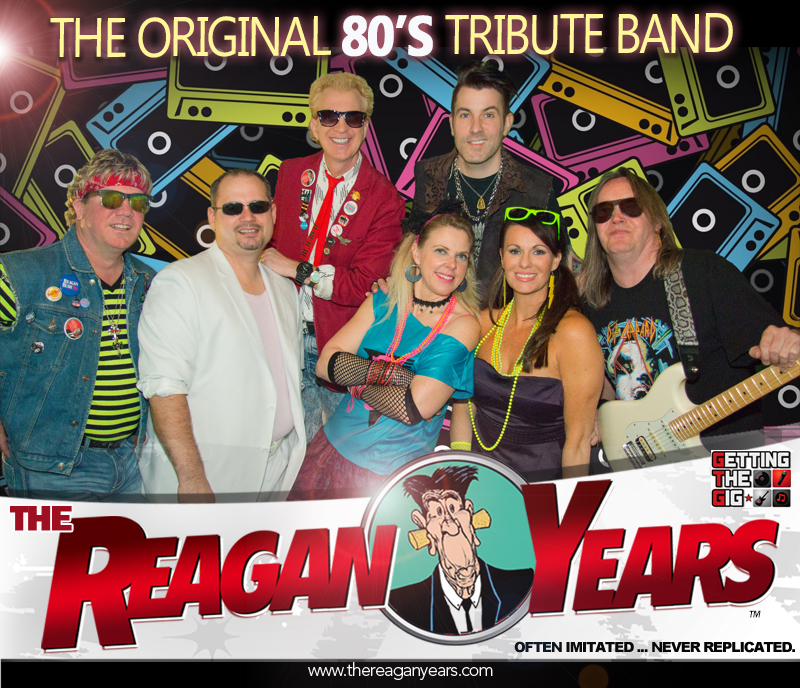 The Reagan Years is the premier 80s tribute in the Baltimore - Washington DC area. The band leads a high profile campaign which includes performing Black Eyed Susan Day in 2015, opening for Loverboy at Ocean City's Spring Fest 2014, headlining Apple Blossom Festival in Winchester VA in 2013, In 2011 the band was performed as part of GEs Ronald Reagan centennial birthday celebration at the Reagan Building in Washington DC. In 2010 the band entertained over 8000 for the Official Tailgate Party of the Military Bowl held at the DC Armory, other events that year include headlining Big Night Baltimore, performing Harborplace's 30th Anniversary, and Frederick MD's 4th On The Farm Independence Day celebration with attendance approaching 11,000. The Reagan Years performs wedding receptions, 80's corporate events and other retro gala events.